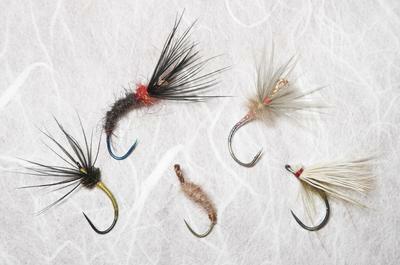 I've now had the chance to tie on and fish with a few eyeless tenkara hooks, and I'm starting to get a feel for them. First, some general observations about eyeless hooks. From a tying perspective, they take slightly more work, and you don't get a nice narrow shank near the head. This could be an issue if you wanted to tie slim-bodied flies. I'm mostly using silk cord, but I've also had success with synthetic cord, including monofilament. I failure tested a few eyes; making sure the tippet broke before the eye. From a fishing perspective, the big eyes are easy to thread, and seem to hold fish well. after catching a bunch of fish, the eye will get stretched thin, making it harder to thread a second time. It's also hard to cut old tippet off cleanly without damaging the eye. Subjectively, I really like the look of silk-eyed hooks. Gamakatsu Amago: One of my favorite hooks. The size and shape are about perfect for kebari, the super sharp barbless point holds fish well, and is very easy to then get out of the fish's mouth when it comes time. There's something about the shape that usually keeps most of the hook outside of the mouth and easy to grab, making it easier to clean than most other barbless hooks. Owner Keiryu: Another good kebari hook. The point has a tiny micro-barb; the smallest I've seen. Even when crushed, however, there's slightly more resistance to cleaning from the fish than the Amago. For this reason, I prefer the Amago, but the Keiryu is probably the easiest-to-clean barbed hook I've used. Fishing performance is comparable. Hera S-Prost: I wanted a smaller eyeless-barbless hook, and this fits the bill nicely. When tied as kebari, I don't seem to get as many strikes as I do with the larger Amago. It does, however, make a mean killer bug. Overall, a well made hook for a good price; making it a great option if you're looking for a smaller fly.